Keith Williams is an artist, writer and cartoonist. He spends most of his time drawing and creating fanciful characters. He takes great pride in turning a blank piece of paper into art. 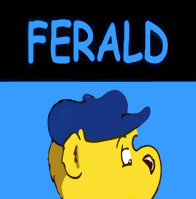 His Ferald characters were created for the medium of art, publishing, licensing and animated projects. Within this realm, he has created a whimsical spark, who celebrates the wonders and various emotions of life, seen through the eyes of an upbeat and unruly ferret.